Hi Winnie. Welcome to Read Your Writes Book Reviews. How are you? Thank you so much! I am busy, busy, but all in a good way. That’s good. Before we get to questions about Kneaded to Death, I have to ask if it’s difficult to write under multiple names? Do you ever forget what name to sign at book signings? Actually, that’s funny because I do! I have started signing the wrong name once or twice, so I really think about it before I sign. I’m going to be so honored, though, to sign Winnie Archer. Winnie was my grandmother’s name, and Archer was my great-grandmother’s maiden name. As pseudonyms go, it’s a good one. Wow. That’s amazing. I’ve always wondered how authors came up with pseudonyms. How did you go about creating your characters for Kneaded to Death? Did you have any inspirations? I love strong female characters and relationships more than anything so I knew I wanted a multi-generational element. My Magical Dressmaking mystery series has a strong mother/daughter/grandmother trio. I wanted to create something similar, but unique to this series. Ivy Culpepper came first; the name itself helped her character come to life for me. With her mother gone, Ivy needed people around her to lift her up. She needed other strong females. Enter Olaya Solis and Penelope Branford. One owns a bread shop and the other is an octogenarian. They were perfect and developed so organically as I wrote. I knew I wanted a law enforcement figure and who better than another strong woman, Ivy’s best friend from school, Emmaline Davis. The men followed: Miguel Baptista, the former boyfriend, Ivy’s brother Billy, and her dad. I always think about who would play the characters in a movie; it helps me visualize. For Ivy, I envision Emma Stone. So in some ways, yet another strong female was part of my inspiration. Tell me more about Ivy Culpepper. How old is she, what is she like? Ivy is 36, divorced (after she left a cheating husband), and has returned to Santa Sofia, California (from Austin, Texas) after the death of her mother. I’d say that she’s a little bit lost without her mom. She’s not one to back down from a challenge, and as with any good amateur sleuth, she’s curious—especially when a murder crosses her path. How and why did you decide to set the Bread Shop Mystery Series in Santa Sofia California? Is it based off of a real town? Santa Sofia is a fictional town modeled after the romantic Santa Barbara with a little San Luis Obispo thrown in. When I was thinking of what to name the town, I turned to my daughter, Sophia. It was perfect! Although I have lived in North Texas for almost nine years, I was born and raised in California so a coastal town there felt like a natural setting. My other series is set in a small Texas town, so that was another reason I went with California for this book. What's your writing style like? Do you start out with an idea of how the person is going to die and then figure out who dies and why? Or do you just somehow let the story play out? My writing style is a combination of both. I have the basics of the mystery plot and I have a beginning, middle, and an end. But so much develops as I actually write and as the characters become real to me. What's the most difficult part about writing a cozy mystery? And what's the best part? The best part is definitely the characters. I fall in love with all of them. They’re like friends; I want to be with them and find out what they will do next. The most difficult part is making sure the mystery ‘works’. I always worry that it won’t make sense or that I’m not communicating the core elements well enough, but then it always comes together in the end. I’m a middle school teacher, so I write in the evenings, on weekends, and all summer long! Was there anything about Kneaded to Death which actually surprised you? There are a few twists in this book that surprised me. I didn’t plan one of them. It happened organically and it just really worked! Winnie, thank you for taking time to answer some questions for me. Congratulations on Kneaded to Death. Winnie Archer is the pseudonym for national bestselling author Melissa Bourbon. 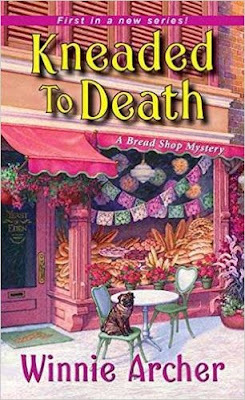 You can follow the Kneaded to Death Blog Tour here. I am getting so excited to read this! I really enjoyed her Magical Dressmaking series. Nice to get to 'know' her via the interview--my grandmother was named Winnie too! Thanks for stopping by. I hope you enjoy the book. Good luck in the giveaway. Fingers crossed you're one of the winners. Winnie is a nice name. Winnie is such an old-fashioned name, isn't it? When I chose a pen name, it was no contest. I hope you enjoy the book, holdenj ! !